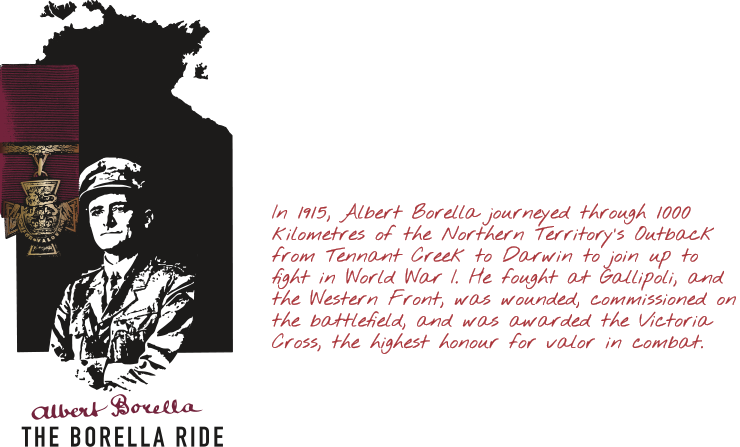 Borella set out walking to Darwin in 1915 because he had no other choice. Travelling 100 years ago was very different to today’s choice of convenient buses, trains, planes and private motor vehicles. In the Outback, roads were hardly existent, with mechanics and petrol in short supply. Plus the reliability of cars and motorcycles was suspect and they broke down frequently. The best route that Borella would have followed was the Overland Telegraph Line track, as it was clear enough and reasonably well used. Borella didn’t have access to a horse when he first left the Tennant Creek region, so his only option was to walk. Travelling in the wet season was a challenge for Borella with constant rain and storms, which meant he often had to swim across flooded creeks. He would most likely start walking at dawn, when he had light to see by, taking advantage of the cooler hours. As the sun got higher and the temperature and humidity rose, Borella would rest for a few hours, preferably in the shade near water while having a little lunch and maybe a nap. Late afternoon was a good time to continue walking and also take the opportunity to hunt for game, providing food for that night and perhaps the next day. Borella carried a rifle, both for protection as well as hunting, and the ammunition in his light pack was as essential as his knife and spare socks. As a commemorative activity, The Borella Ride aimed to spend as much time as possible with local communities. So that not all of The Borella Riders’ time was spent on the road, the Riders represented the first part of Borella’s journey by arriving and departing each location on foot.